Mr. N. Karamouzis holds the positions of the Chairman of the Board of Directors of Eurobank Ergasias S.A. and Chairman of the Board of Directors of the Hellenic Bank Association (HBA). At Eurobank Ergasias S.A., he is also the Chairman of the Strategic Planning Committee and Member of the following Board Committees: Risk Committee and Nomination Committee. He is also Member of the Bank's Legal Council, as well as BoD Member of Eurobank Cyprus Ltd. 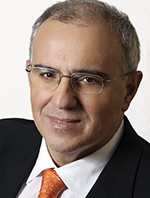 In addition, he holds the positions of Vice Chairman of the Hellenic Federation of Enterprises (SEV), Chairman of the Hellenic Advisory Board, South East European Studies at Oxford (SEESOX), St Antony's College, Oxford University, Member of the Advisory Board of diaNEOsis, Vice President of A.D.R. PROMOTION ORGANISATION - ADRO, Member of the Board of Directors of Onassis Foundation and Member of the Board of Foundation for Economic and Industrial Research (I.O.B.E.). He has served as Chairman of the Board of Directors of Global Finance S.A., Vice Chairman of the Board of Directors of the Association of Greek Tourism Enterprises (SETE), Member of the Board of Directors of Olympia Development S.A, Mytilineos S.A., Hellenic Telecommunications Organization (OTE S.A.) and Chipita S.A.
Mr. N. Karamouzis holds the position of Emeritus Professor at the University of Piraeus in Greece and held until September 2013 the position of Professor at the Department of Banking and Financial Management at the same University. He has taught at the Pennsylvania State University, Case Western Reserve University, Athens University of Economics and Business and Deree College in Athens. He has numerous publications in professional journals, magazines, books and newspapers and has given many lectures, speeches and presentations at conferences and events.